I've lived in Regina since 2008, but until last summer, I had never explored farther south than Avonlea. I finally decided that the Big Muddy Badlands might be a worthy day trip. To my surprise, I was so captivated by the area that I couldn't resist staying overnight. I've always been partial to the woods and water of the North, but I have a new found respect for the wide-open South. I set out from Regina around 11 am with no real itinerary. After a missed turn off the Canam Highway and an unplanned trip to Weyburn, I finally found myself descending into the Big Muddy Valley south of Bengough at 2 pm. 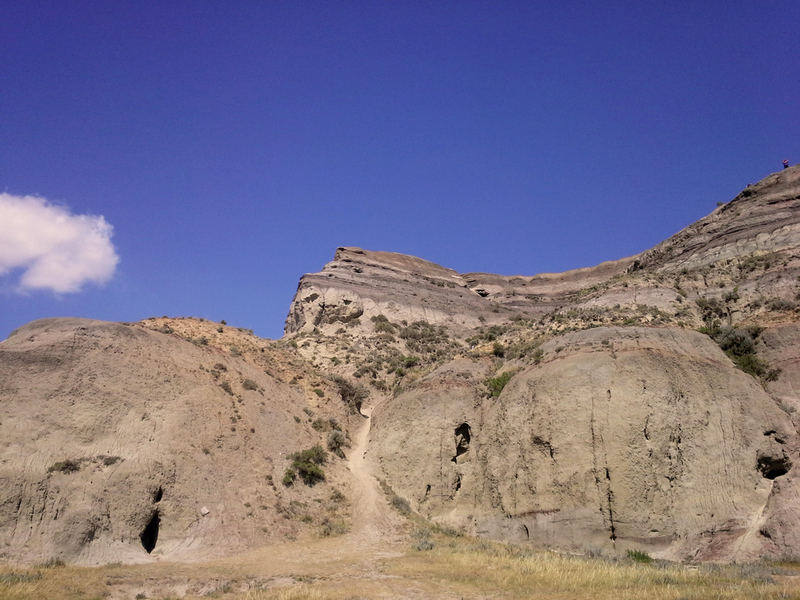 This is the home of Castle Butte, a 230 ft sandstone outcrop that's just ripe with small caves to toss your beer cans in (this is a joke, I think). I've seen amazing photos of this place, especially in this series by Robin Karpan, but it's nothing compared to the view in-person and from the top. Imagine a 360 degree panorama of the expansive grassy plain, all contained by distant walls of sandstone and clay. There's a prehistoric quality to this land. 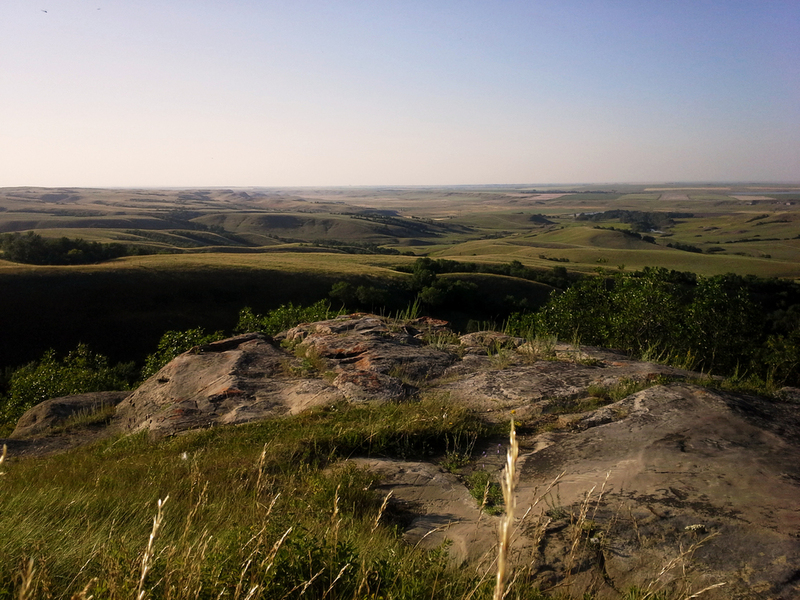 Standing so high above the prairie makes you feel grandiose and infinitely small at the same time... Or it could just feel like a big dirty hill if you're in a bad mood. I had not actually planned my trip further than Castle Butte, so I proceeded to tear up some back roads until I found myself headed for Lisieux Pond. This is a tiny trout pond occasionally stocked with rainbow trout. I had barely been there 15 minutes before the line was peeling off my reel faster than spaghetti off of Oprah's fork. Sorry for the smug look. 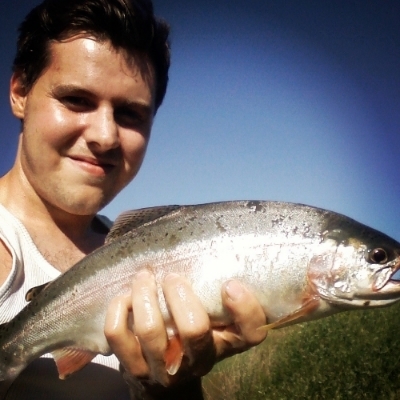 Blame it on that chubby rainbow trout from Lisieux Pond. With my fishing fever staved off for at least another 12 hours, I made my way toward the Saint Victor Petroglyphs. True to my M.O., I took another wrong turn and got lost down some back roads. Wild sunflowers gilded the edges of these winding gravel pathways like a campy racetrack in Mario Kart. I stopped my car several times as I traced the contours of the hillsides finding myself valley after valley of heart-stirring scenery. Precious daylight was slipping me by, so I could only visit the petroglyphs for a short time. 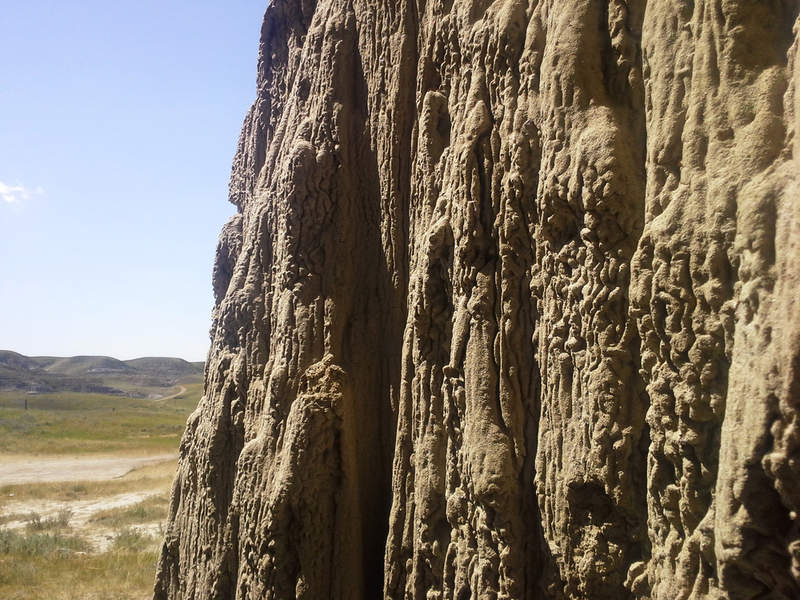 There are over 300 carvings of animal tracks on this high sandstone outcrop whose history largely remains in debate. The petroglyphs in the photo above are only a replica since the real ones are difficult to see. The consensus is that the spot must have had a great spiritual significance, as suggested by the labor intensive carvings and the stunning vantage point of the St. Victor Valley. I couldn't help but feel lucky to be here. The area is so sparsely populated, it's no wonder that many people will pass this by. 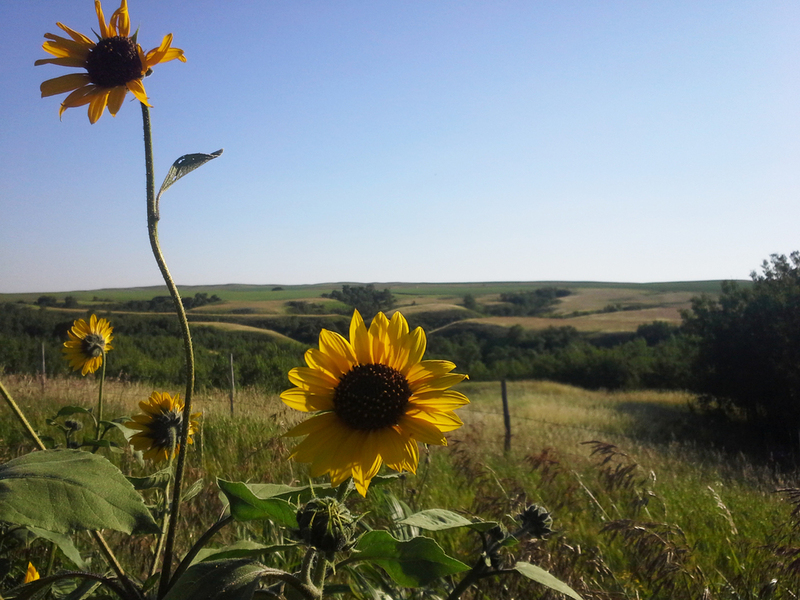 I spent the night at Jean-Louis Legare Regional Park, a campground near Willow Bunch. After a day like this, I couldn't have asked for a better place to stay. The campsites are nestled in a beautiful grove which was perfect for setting up my hammock to sleep under the stars. 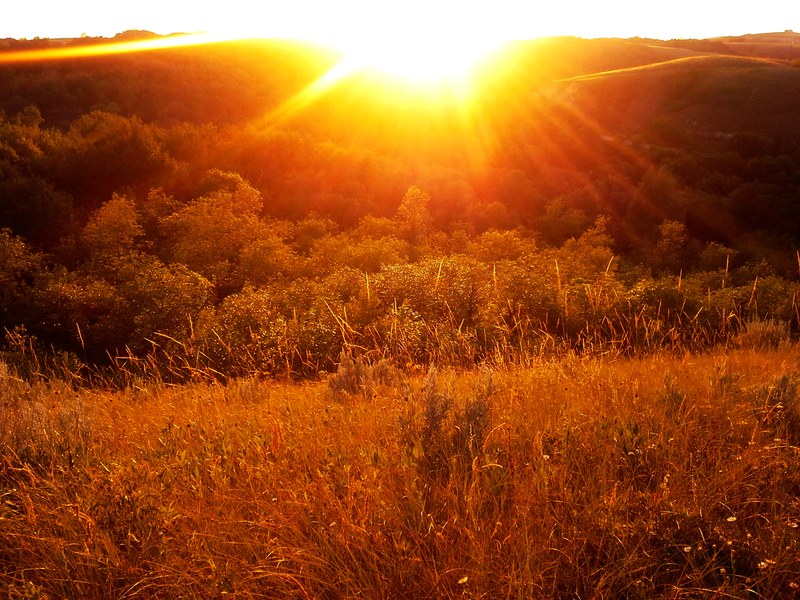 Around midnight, I decided to explore the coulees and made my way to the top of a hill. I laid in the grass and was treated to the most active meteor shower of the year. Writing about this trip has been fun, but please don't actually litter beer cans. Also, Oprah is a handsome woman worthy of respect. I plan on heading back south sometime soon, so stay tuned!